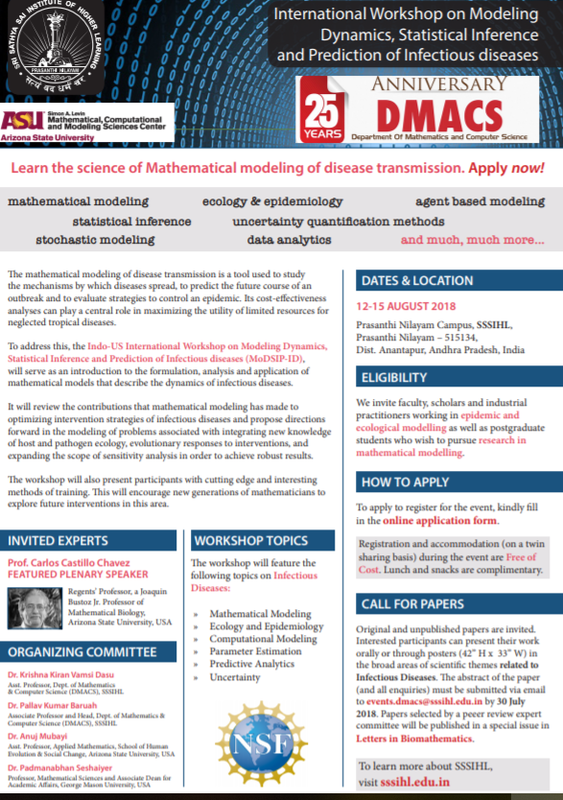 Modeling Dynamics and Prediction of Infectious Diseases is the first international workshop organized jointly by researchers at USA and Indian Institutions. It will be organized at the Sri Sathya Sai Institute of Higher Learning (SSSIHL), Puttaparthi from August 12-15. Organizer Prof. Anuj Mubayi, from Arizona State University (ASU), highlights that the focus is on training undergraduate, graduate students, and researchers about cutting edge mathematical modeling concepts, and computational techniques for tropical infectious diseases. India has experienced accelerated spread of diseases and faces growing challenges. However, both academia and policy makers may have the opportunity to construct intelligent alternatives for global health. The workshop will cover three different scientific dimensions. Mathematical modeling: deterministic and stochastic theory. Interdisciplinary work from ecology, epidemiology and public health. Finally, Educational component based on research methodology and, mentoring. The workshop will feature a plenary talk by a distinguished mathematical biologist Professor Carlos Castillo-Chavez from ASU. With more than 200 publications, Dr. Castillo-Chavez is a Regents’ Professor of Mathematical Biology, and a Distinguished Sustainability Scientist, founding director of the Simon A. Levin Mathematical, Computational and Modeling Sciences Center. His programs have received White House Awards: Presidential Faculty 1992 and Presidential Award for Excellence in Science in 1997. The workshop is free and will provide accommodations to selected participants. Prof Castillo-Chavez will also visit the Indian Institute of Science-Bangalore, the Public Health Foundation of India, IITechnology-Kanpur, and South Asian University-Delhi to build future collaborations.